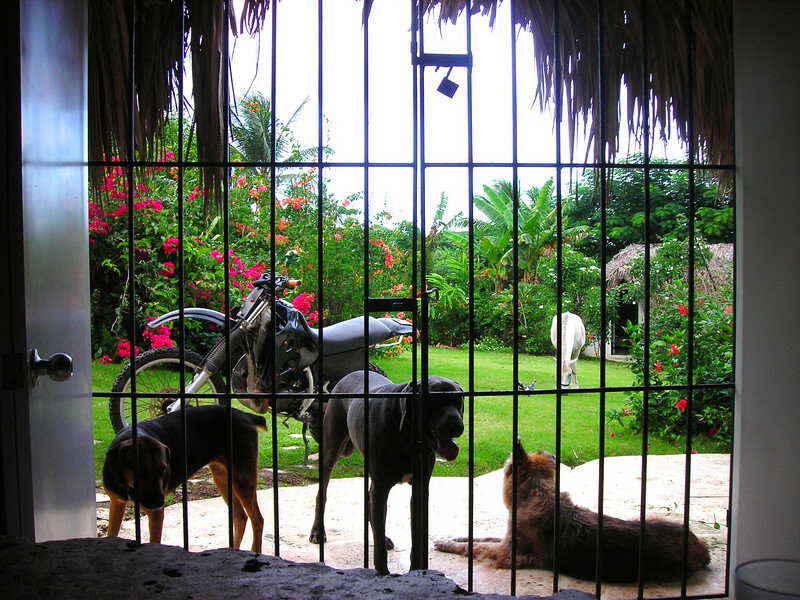 We changed our plans to buy a used motorcycle in Thailand and ride there for six months to heading down to Mexico again, 6 months riding 2-up on our Harley Sportster. We have less then four weeks before we take off so I have to get the Sportster ready, Now; new breaks, tires, fluids, lube the cables, check this and check that. This is extreme fun for me and I can tell Heidi is feeling it to. While doing general internet research on HorizionsUnlimited.com, I’m reading an article about a ferry running between Puerto Rico and the Dominican Republic. 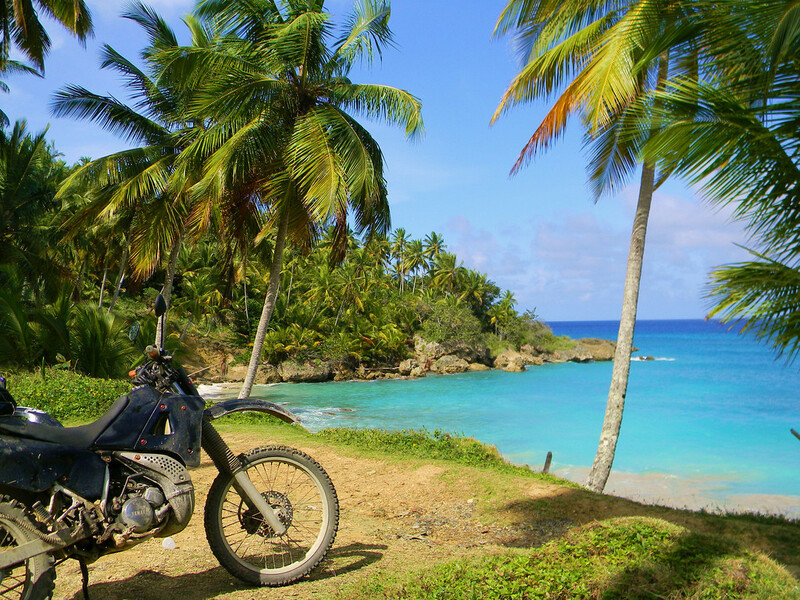 Just for the fun of it, I suggested we could fly to Puerto Rico, purchase a used motorcycle and ferry it to the Dominican Republic. Now I feel confetti shooting out of the tops of our heads. 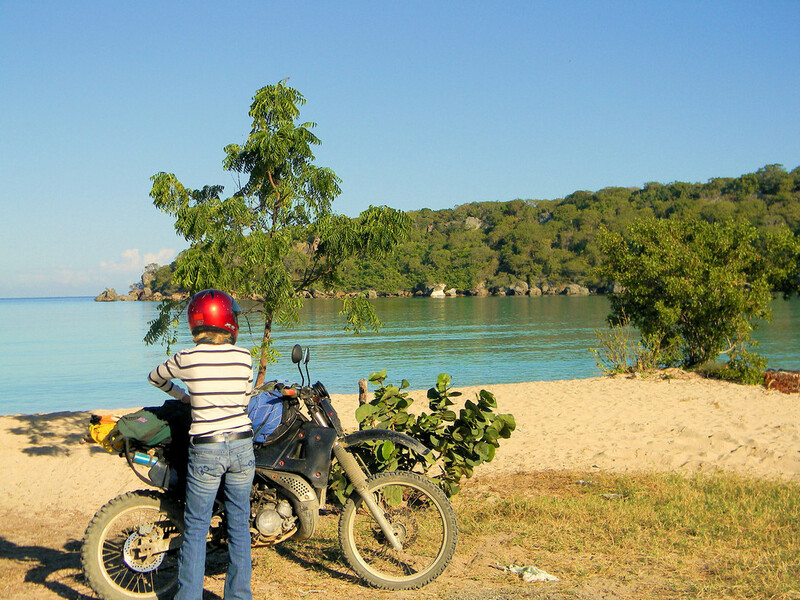 We spent two years in the Dominican Republic back in the mid nineties and rode a motorcycle all over the island. It was great fun and a dream life. Every year we talk about repeating the Dominican Republic but for some reason we decided against it. This time we can find no reason not to go back. 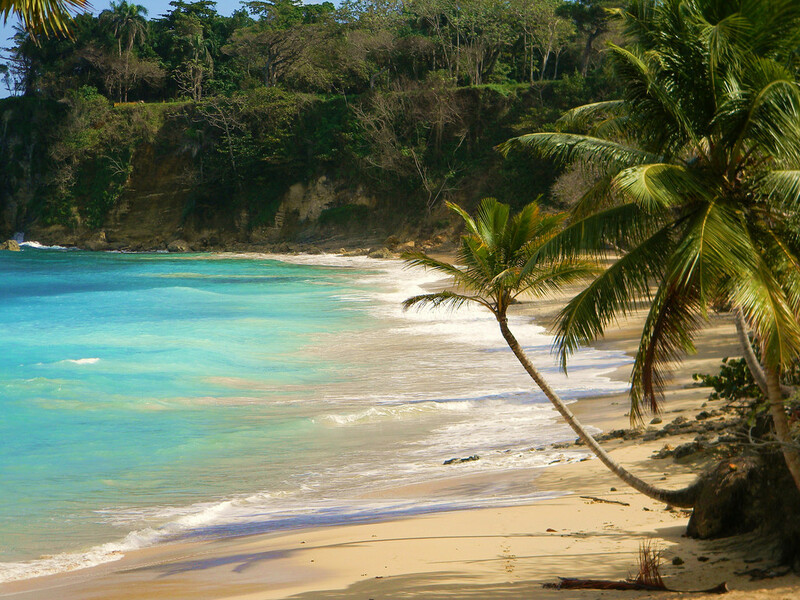 The Dominican Republic, here we come. In record time, we have base camp reserved and an unbelievable deal on a motorcycle. What is wrong with this picture? We land in Santo Domingo, the country’s capital. We each have a helmet and Heidi brings a pillow. We have a 6-hour bus ride to the other side of the island so the thought to spend the night here. We want to show up at the new place in the daylight because we are not sure exactly where it is. Our guidebook suggests we pay $20 US for a cab ride from the Santo Domingo airport to downtown. The first cab driver quotes forty bucks. I say “No way!” and start walking away in a huff. Heidi is not feeling well from a bad cold but is also not hip on getting ripped-off. A big guy standing next to us is witnessing this and asks if we would to share a taxi. Way cool, twenty bucks split. Charles is from Barbados and is here for a business convention. What a nice guy, he asks us all about our trip and thinks we are doing a great thing. He talks to the cab driver asking how he got into the cab business and about the good places to go in Santo Domingo. Charles asks where the safe places to go are here. The cab driver replies “Nowhere is safe here anymore” Charles gives us his business card and invites us to visit him anytime if we are ever in Barbados. We are dropped in front of our hotel, Santo Domingo colonial district. The rooms facing the street are reported to be great with balconies overlooking all the action. When we get up to the receptionist, we are told there are no rooms available with balconies. We are shown another room. The room is clean but had NO windows and the price is over fifty bucks. We are hot and sweaty from lugging our gear up a flight of stairs and Heidi was not happy due to her miserable cold. The people are extremely nice turning the air conditioner on and bringing us towels and toilet paper. Heidi is in the room and ready to settle down. However, I am not happy, I want a balcony or at very least a window. I step up and refuse the room. Heidi is not pleased. We thank the receptionist and lug our gear back down the stairs. Out on the streets it is chaotic. I suggested we try to get on a bus to the North coast and get to our place tonight. I flag down a taxi, Caribe Tours bus station. Luckily, I have taken this bus from Santo Domingo to the North coast several times before, so I know the ropes. I just do not know if a bus is going there tonight. Six hours after we left Santo Domingo we arrive in Sosua, the closest we can get to our destination. I get a taxi , the only problem is that nobody has ever heard of the place where we are going. 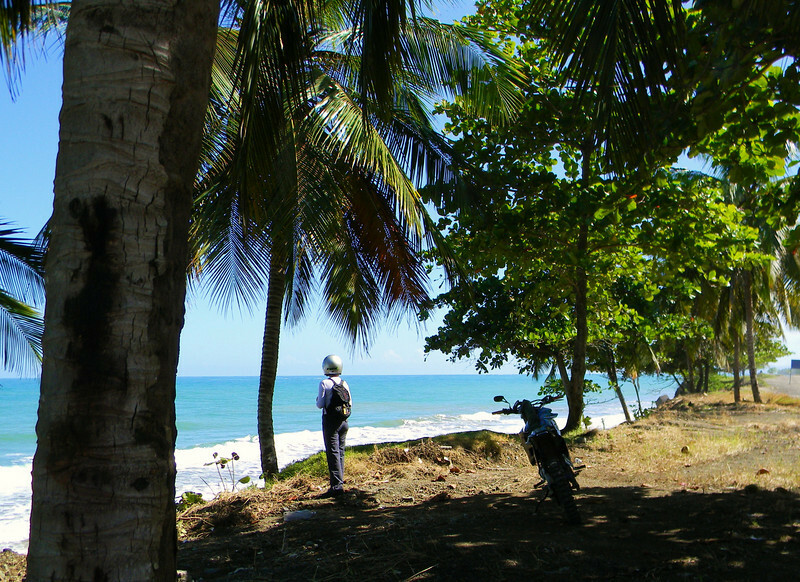 Humm… I know it is near a surfing beach that we both know about, I think from there we can find it. I know it is just two blocks off the highway, and two blocks down a side street. Well of course, it is pitch dark but the cab driver seemed to know where the surf beach turnoff is. We turned off the highway and soon are stopped by a pile of boulders blocking the road. The driver backs up and tries to circle around. We are stopped by another pile of boulders. Heidi is starting to freak out. I tried to reassure her that we are very close. The cab driver stops to ask a resident if they know Veronika. The resident gives us directions. We again drive and again hit a roadblock. Heidi freaks out some more. I try to reassure her. Finally, while the cab driver is attempting to turn around on the narrow rocky street, again, I get out of the cab and of course find myself standing right in front of the gate the ‘Surf Break’. What luck. OK, it is driving me CRAZY riding without a rearview mirror. Often there are people walking in the shoulder, or a car pulled over in the shoulder, or a large pothole is in the shoulder that I want to avoid, or there is no shoulder at all to ride on, so I have to ride out into the main part of the road. I don’t know how everyone else does it but I have to turn my head around and look behind me before I veer out onto the main part of the road. When I have my head turned backwards, I am not seeing where I am going. Not Good! 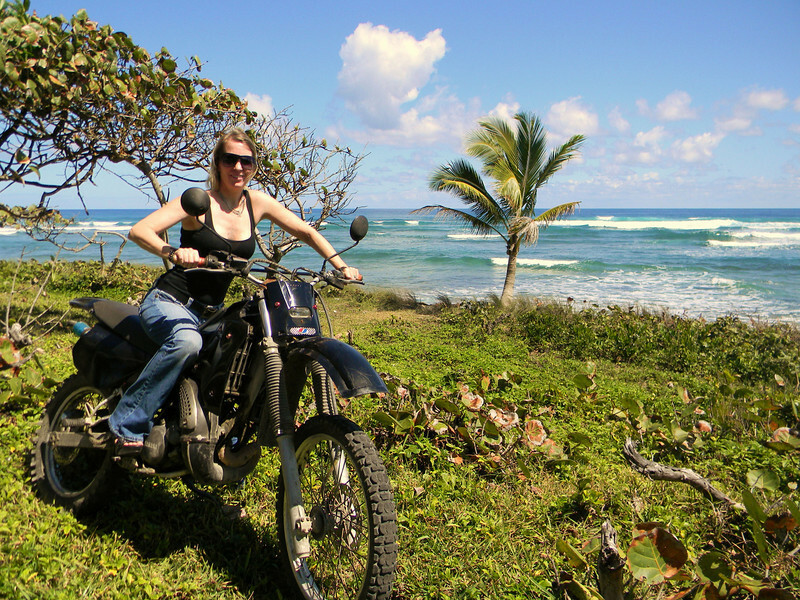 Heidi and I load up the motorcycle for a day ride along the north coast, just for fun. The food is still fabulous, we will return here again and again. 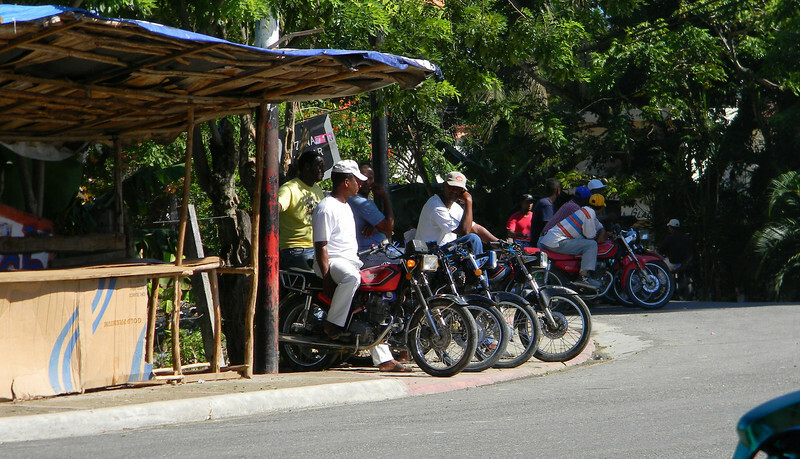 Motorcycle taxis called ‘motoconchos’ are seen everywhere on this island. Our seat is not made for the long 2-up touring we do, so we need to rest often. Luckily there is no shortage of good places to pull over and chill. Some beaches we have all to ourselves. 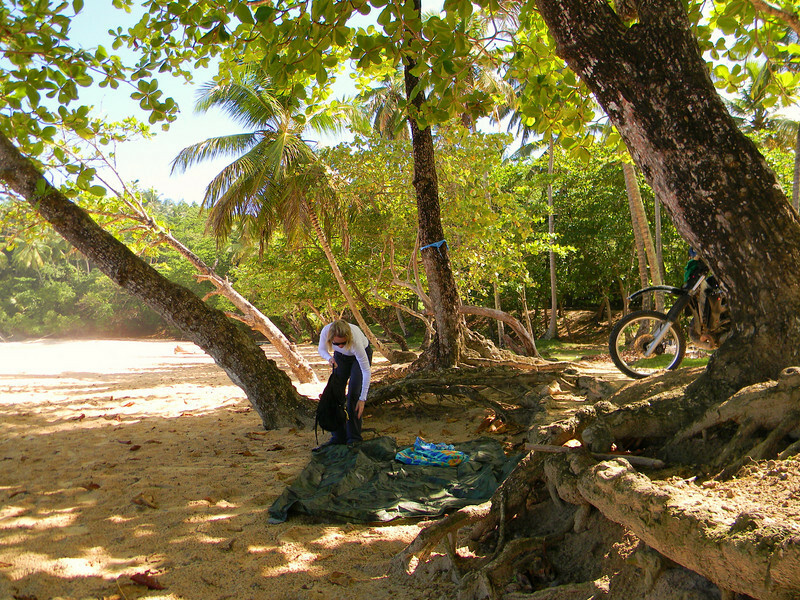 We lay out a tarp in the shade at playa Grande (Big Beach) and play cards. This place has a lobster shack and beer stand. 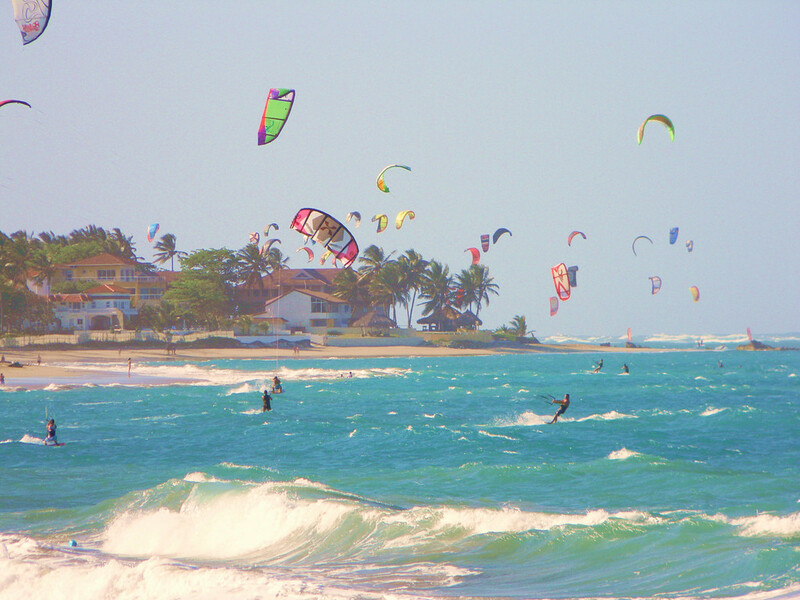 Back to Cabarete Beach, our home for the next six months. Mambo, sweetie and Nina are waiting back at base camp. I’m bringing my camera on another motorcycle ride. 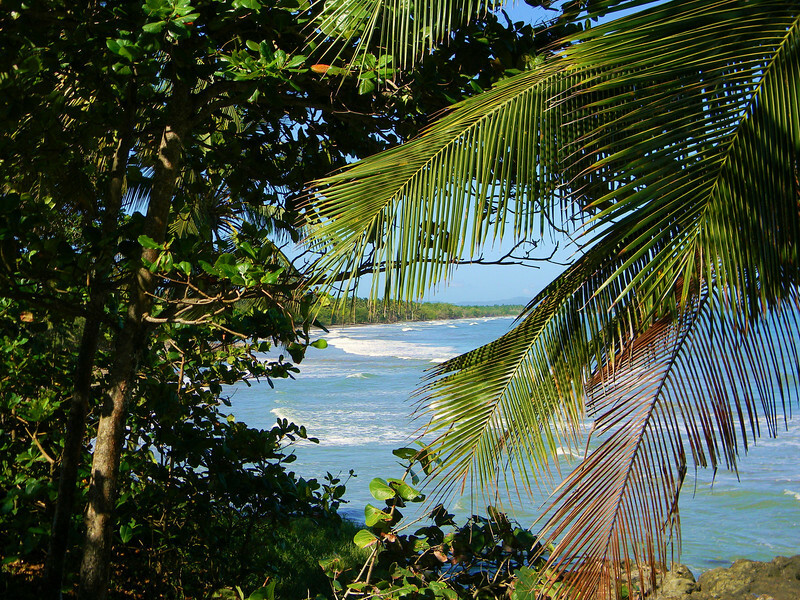 Stretching along the north coast of the Dominican Republic is the Cordillera Septentrional mountain range. 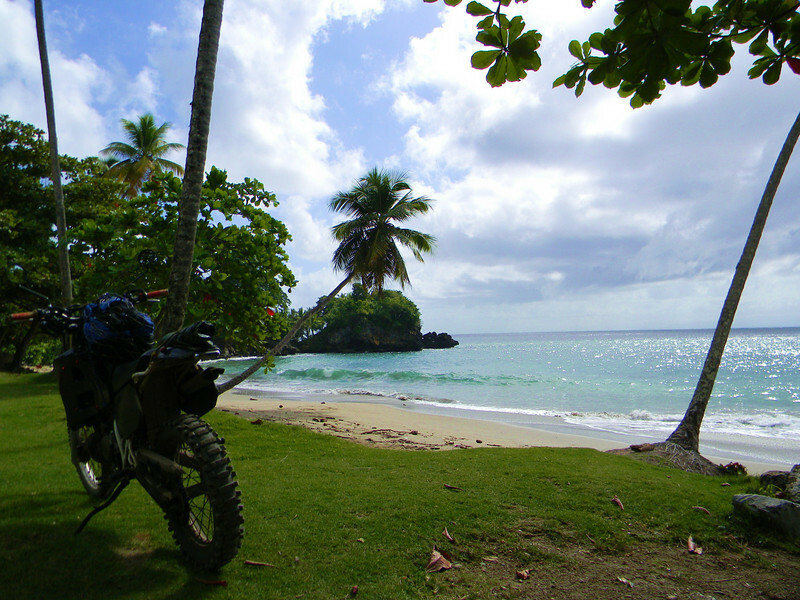 The mountains are littered with rough dirt roads and tracks, unlimited motorcycle adventure opportunities. Fifteens years ago I had numerous favorite trails into the mountains but today I look for something new, not too difficult of a task. This is what I do; Look for a cluster of homes, or shacks along the main road running along the north coast with a dirt road heading inland. I turn onto the road and ride. If the road does not end within a kilometer, chances are that I am heading into adventure. After a couple dead ends, I find a road heading up into the mountains. The roads are so rough and steep that I want nothing else but a dirt machine to ride them, but of course, I pass several small road bikes riding the same road. I stand up on the pegs and goose the throttle of my 2-stroke enduro. 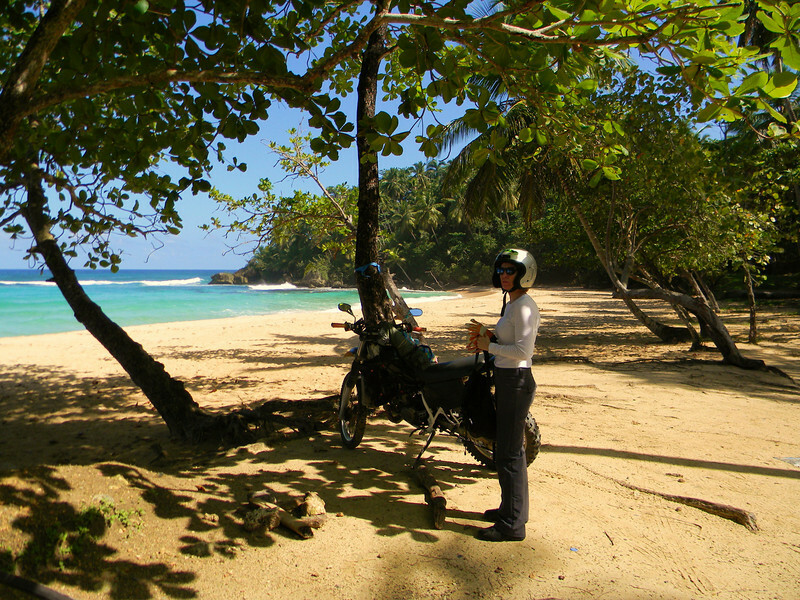 What a blast, I bounce over, around and through gullies and rocks through some amazing scenery and Dominican culture. This road has many farms and small communities along it’s steep sides. I pass donkeys loaded with water jugs or bundles of wood. 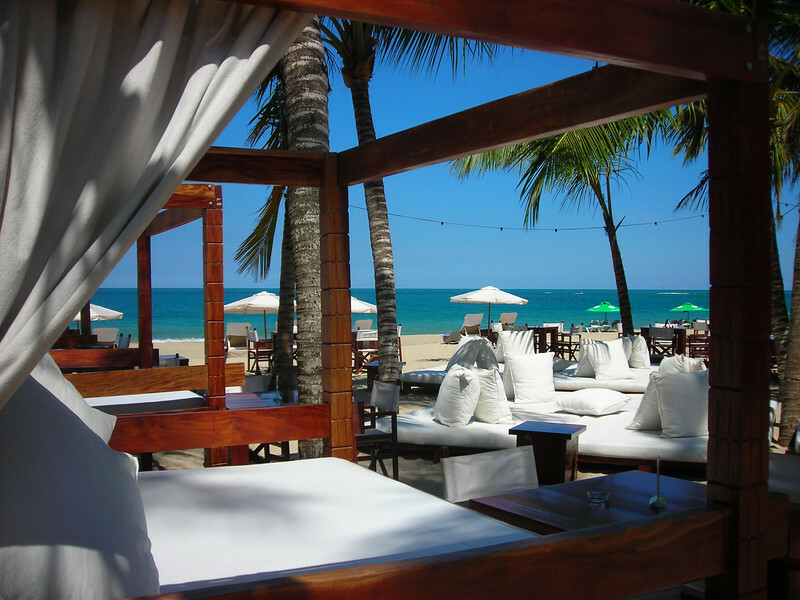 This is Saturday and there are gathering places with dozens of Dominicans hanging out having fun socializing. I try to play it cool and fit in but I knew I stick-out like a sore thumb. Everyone looks at me as I drive by. 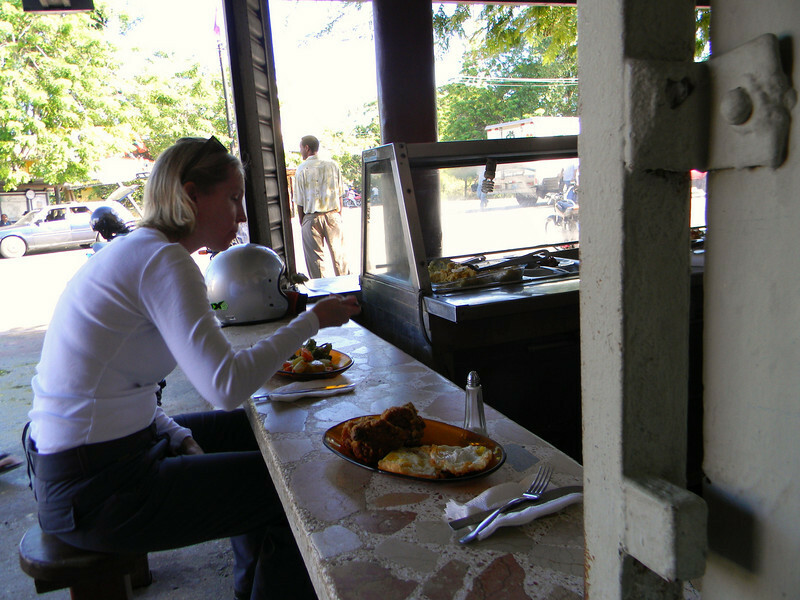 I enjoy stopping at meeting places for some small talk with locals or at small markets, often the size of a large closet, to buy something to eat and chitchat. These are often my most rewarding experiences. 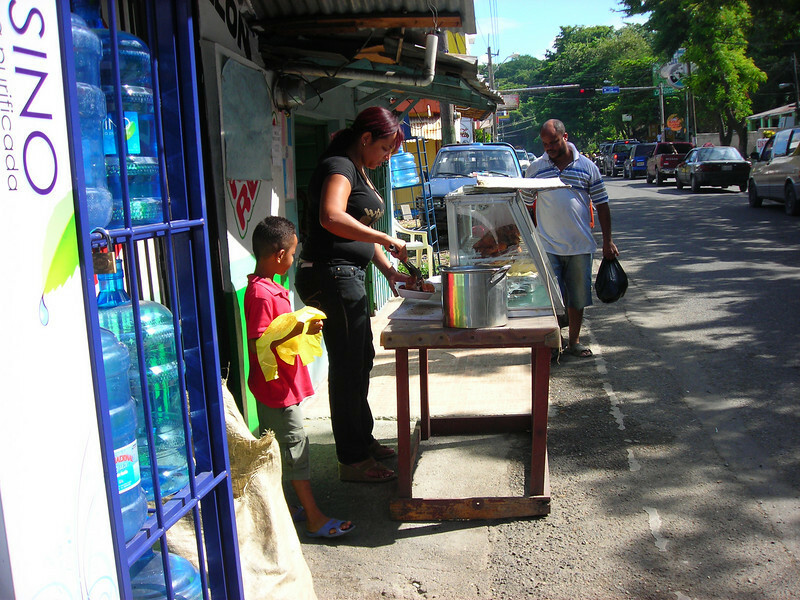 Dominicans away from the tourist areas are so warm and friendly it is hard to describe. I speak Spanish and nothing but Spanish and whom ever I talk with enjoys helping me with my pronunciations, accompanied with a huge smile. I have to apologize but I could in no way take any photos. It would have shown disrespect and shown no class on my part. When people are so nice to me and treat me like their friend and make me feel welcome, I cannot flip out my camera and take a photo of them. I just could not. 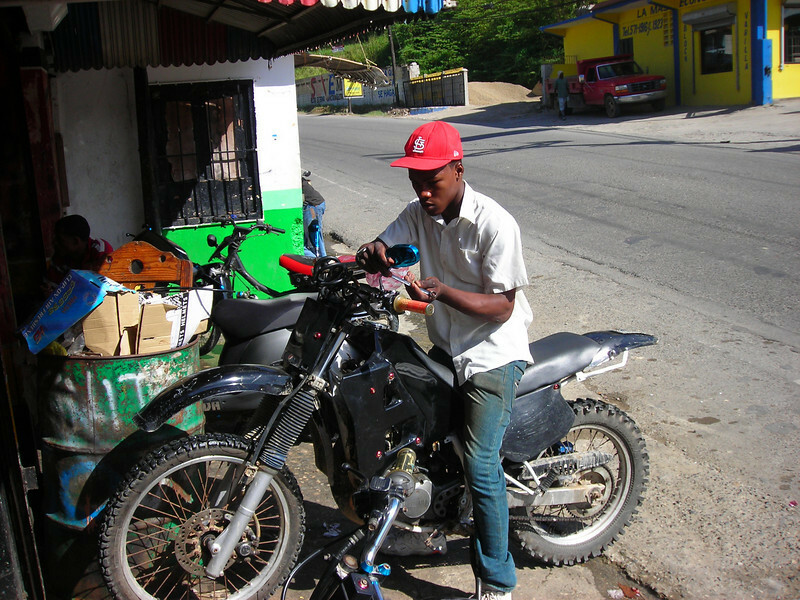 So I come away from my first off-road adventure with no photos and only a heart warmed peaceful feeling the Dominican people gave me. I will accept that any day. But have no fear, I will find a way to get some photos. Heidi suggested that during my chitchat sessions I explain that I run a website and want to show the world the beautiful friendly people of the Dominican Republic so they will come here and help the economy by exploring their beautiful country, or something like that. I think she is right. I will work on it.